The limited capacities of the banks have led to the emergence of alternative financiers such as trade finance funds, which are typically launched by industry professionals willing to get involved with transactions that are not in the interest of traditional banks. The universe is still in its infancy, with only around 15–20 such funds around the world and total assets under management of less than USD 10 billion. One can easily notice the increased visibility of trade finance alternative financiers in social media, trade finance industry seminars and panels, and also through talking to trading firms that are in need of financiers with greater risk appetite and that are willing to provide more flexible financing. Small- and medium-sized trading firms are likely to be the most affected by the recent changes and challenges in the financial industry that have resulted in the banks focusing mainly on clients that they can “sell the whole bank” to rather than just one product, such as trade finance, the risk profile of which is easier to sell internally. The limited capacities of the banks (which have resulted in an estimated annual trade finance gap of USD 1.6 trillion) have led to the emergence of alternative financiers such as trade finance funds, which are typically launched by industry professionals willing to get involved with transactions that are not in the interest of traditional banks. The universe is still in its infancy, with only around 15–20 such funds around the world and total assets under management of less than USD 10 billion. The main reason for this seems not to be limited demand, with more and more need for working capital finance in the form of trade finance, but more from the still relatively limited familiarity of investors with trade finance as an asset class. It may be that trade finance will never be recognized as a discrete class but simply a specific debt sector, similar to the original Basel regulatory slotting of “specialized lending”. The very same reasons justifying the “specialized lending” criteria in the eyes of the regulators should give comfort to investors seeking fixed-income-like investments with a specific touch. Funds will not be subject to the shareholder return hurdle rates specific to banks, but to the more direct return expectations of investors. This means they will typically command significantly higher pricing than traditional bank lending and that they will need to provide sufficient added value to their borrowers. Depending on their investment strategy, such funds may have a broader mandate to which they will remain committed and that will be less exposed to factors such as sudden strategy shifts resulting from changes in banks’ internal management. These can strip companies of much-needed financing and potentially even lead to reputational risk for their clients. Regulatory oversight will also be different depending on where the fund is incorporated, so they will not suffer from the often overburdened compliance that can cripple banks when it comes to entering new relationships. Similarly, the fund’s activities will not be subject to bank-specific risk factors that influence business appetite and time to market. The skillset of trade finance funds’ originators and portfolio managers is often different from those of traditional, often generalist, banking personnel. With a “can-do” attitude, they will be accustomed to visiting relatively unknown firms without a well-known brand and often based in locations that are off the beaten track. There will be limited to no discussions about the cost of on-the-ground due diligence, such as visiting warehouses and mines, and they will have the skills to know whether what they are seeing is a viable flow with acceptable performance risk regardless of what (often non-audited) accounts say. Banks will remain confined to calculating probability of default (PD) risk ratings as the main driver of their risk appetite grids, and will continue to look at the equity of the trading business as a first rule of thumb in deciding whether they want to engage. Funds, on the other hand, while still looking at the size of the operation, will take most comfort from the actual underlying flow, its logistics and the risk mitigation structure in place, meaning how the contracts, assets under them and related cash flows can be sufficiently ring-fenced in order to ensure repayment of the exposure. Bankers will of course look at such mitigating factors as well, but despite there being sufficient transaction merits, many other factors could still represent unsurmountable hurdles. The general aim of funds will be to maximize the utilization of their credit line, and they will not be subject to the same asset and liability management processes that banks undergo, which frequently require them to manage down or limit certain exposures contingent on funding, liquidity or risk considerations. Some funds will go as far as substituting themselves to the trading company and becoming part of the structure to ensure better control of the transaction. Once a favorite structure of large banks, “inventory monetization” will be the bread and butter of certain funds that use such structures to gain direct access to or hold title to the goods rather than deploying complex security structures. Last but not least, KYC processes will be rationalized as funds do not bear the burden of past regulatory issues and sensitivities that certain banks have experienced. Always assessing the markets for investor appetite, funds can deploy their know-how and resources to originate more (or even build a dedicated fund) around the geographic region or type of commodities of interest, or simply participate in some plain-vanilla bank syndicated deals should sufficient diversification be a prerequisite for certain investors to deploy their capital. Banks, however, will continue to be subject to rigid regulatory and internal constraints that limit the breadth of their scope. Funds are potentially competing not just with the banks, but also with the major global commodity houses that have similar skills and mindsets, and that can provide finance options (such as pre-payment), trade directly themselves, take longer-term risks, and fund much larger amounts than a fund can cover within its funding and concentration limits. And yet despite this kind of competition, the alternative financiers have found niches in which they can out-compete both banks and commodity houses. This space seems to mainly encompass the next tier down of credit as clients, smaller and shorter-term trades, and highly specialized areas on which the large trading firms are not yet focused and banks do not possess the appetite or expertise to engage in. What’s more the funds may sometimes actually cooperate with both banks and trading firms by taking tranches of specific deals (such as subordinated high yield tranches) in order to meet specific strategy criteria or simply to maximize liquidity utilization. To conclude, trade finance funds have proven themselves to be viable alternatives and have earned a well-respected place in the “food chain” of trade financiers. As their reputation remains untainted, the likelihood is that an increasing amount of liquidity will find its way towards these vehicles with pre-conditions that they deliver on their strategy and return and that they do not fall under more stringent regulation. 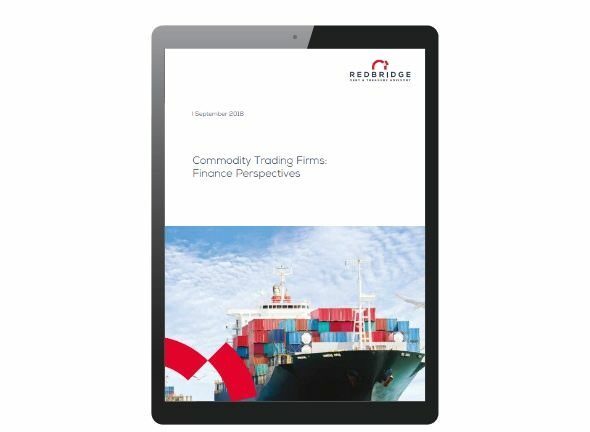 Given the multitude of industry specific challenges at present for commodity trading firms, Redbridge’s consulting team believes in sharing its thoughts on a wide range of topics of interest through a publication designed especially for this select audience. What’s driving the risk appetite of your (potential) financing banks?